There are many pen brands out there, specializing in various things. Most Americans who know more than nothing about pens would recognize the Parker brand as a longtime quality maker. One of the least expensive, most accessible, and longest running products they make is the Jotter ballpoint/gel/rollerball pen that utilizes Parker’s own refill type. I have here the “all stainless steel” version, how does it hold up? The pen itself is obviously all stainless steel. At the back is a very pleasantly tapered click button, followed immediately by the clip shaped as the famous Parker arrow. 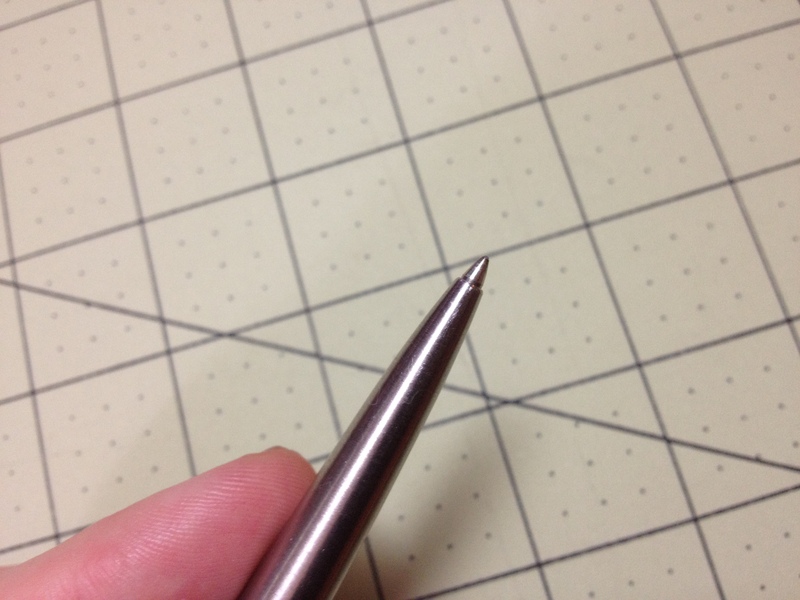 The pen from there slowly bulges and then tapers down to the end where it almost seamlessly meets with the pen’s point when it is not retracted, with only a slight seam 1/3 of the way down the pen where it is unscrewed to be refilled. Now I can’t speak to the Parker brand refill this pen came with as I don’t remember how it wrote and I currently have a Monteverde refill inside (that writes very well, as I said in my review). But I can talk about the feel and sturdiness, both of which are superb. The click mechanism is a bit different and it just feels not as advanced as some of the more modern pens, but it is very solid and satisfying. There’s nothing wrong with it, it just feels older (like using one of those drafting pencils that have been in production for 60 years). And the steel finish is very easy to grip, while beings stylish and well-wearing. Scratches and such barely show up, keeping the pen looking nice and professional for some time. 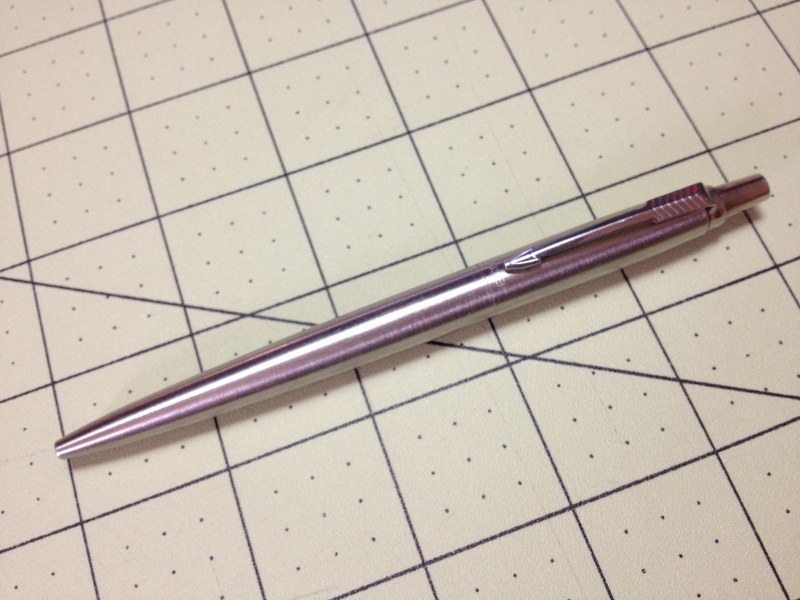 Overall it’s a great pen, and for the price (a little more expensive for the “all stainless” one) it is easily a great value as one pen could last a lifetime (though refills might not be cheap). It’s hardy, with a time tested, solid mechanism, and while it doesn’t look as nice or handle as well (or have as many expensive materials) as the more expensive ballpoints out there it still looks professional, fits in with both modern (stainless) and retro (colors) styling, and can take a rough and tumble life. It’s a tough little trooper. This entry was posted in Intermediate Supplies, Utensils and tagged all stainless steel, art supplies, art supply critic, jotter, parker, parker jotter, parker pen, pen, pens, retractable ballpoing, retractable ballpoing pen, review, stainless steel by Dragon Co (Austin Smith). Bookmark the permalink.